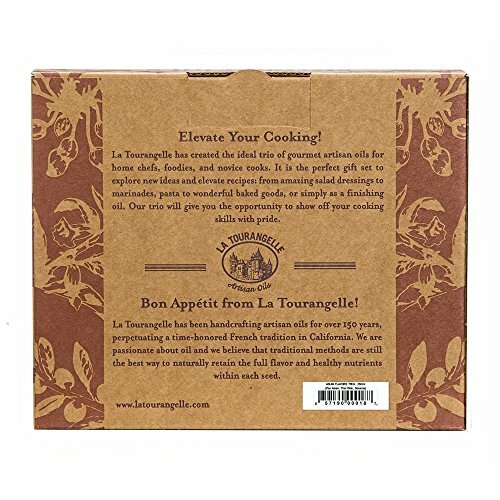 La Tourangelle Asian Flavors Gift Trio is The perfect gift for adventuresome home chefs. This Trio gives enthusiastic home chefs an exciting way to make a wide range of tasty meals from salad dressings, grilled fish, and noodle flavorings, to healthy sautéing. Packed with wonderful flavors, the trio of our artisan oils will allow home chefs to show off their kitchen creations with great pride. La Tourangelle is one of few remaining oil mills keeping a time-honored French heritage of roasting and pressing nut kernels into delicious oils. We are a family-owned company whose mastery of oil production is the fruit of passion, integrity, and pride. We strive to be the best artisan oil producer, dedicated to making carefully crafted, sustainable, natural products. With artisan care, we extract the seeds’ essence and hidden natural treasures to create amazing products that bring delight in the kitchen and well being for the body.Distinctive artisanal oils and great time saver to easily create flavorful Asian dishes: wok, stir fry, marinades. Suitable for medium-high heat. 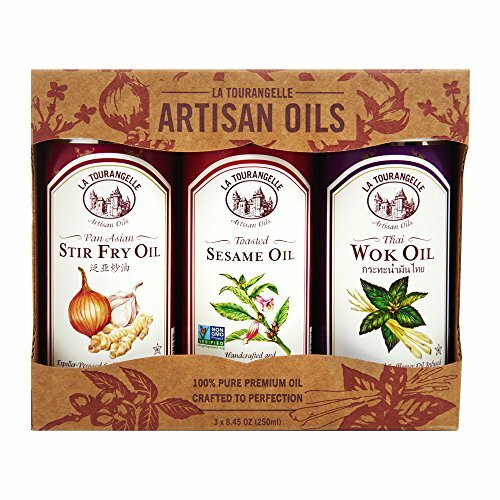 Packed with wonderful flavors, the La Tourangelle Trio of Asian artisan oils will allow home chefs to show off their kitchen creations with great pride. Toasted Sesame oil: rich, deep flavors. Thai Wok oil: Thai basil and Lemongrass. Pan Asian stir fry oil: Fried Onions, Garlic and Ginger. La Tourangelle Trio Gift Set of handcrafted oils is the perfect way to explore exciting new ideas for cooking. Tin Can preserves freshness and flavor of oils avoiding oxidation. Unopened: 24-month shelf life. Opened: best used within 6 months. Par Excellence Producers Yellow Rice, 3….